Well, friends, it happened. The Marvel Machine, which kicked off in 2008, has finally made a female lead superhero film with Captain Marvel. James starts off with a history of the character, Carol Danvers, and Captain Marvel’s roots as a character created for trademark reasons. He goes on to describe the highs and lows of Carol Danvers portrayals. 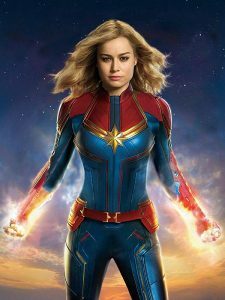 Claire kicks off her production segment with a look at why it has taken so long for the highly successful Marvel Studios to make a film about a female superhero. She continues by asking (and answering) the question of “why Captain Marvel?” and how that ties back to comic book writer Kelly Sue DeConnick and her recent run with the character. The hosts rap up with their opinions on the film and how this episode connects with the previous Ms. Marvel/Kamala Khan episode.